I'm relocating this short post from FB, where I realize that, even though it is public, many readers of ITM may not have easy access. I'm interested in and appreciative of any comments you'd like to pass along. I've expanded the original slightly, since the comments I've received so far have been so rich. 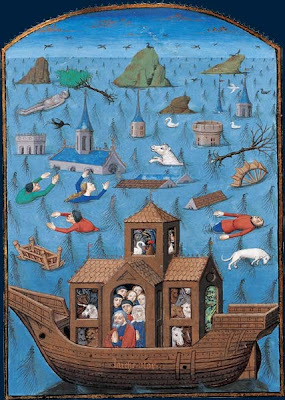 Last Tuesday @Sarah_Peverley shared an illustration via Twitter of Noah and his family in the ark, from a 15th C manuscript now in the Bibliothèque nationale. Profound in its sheer blueness and orderly in its depiction of cataclysm, the image has frequently made the internet rounds, likely because (as Sebastian Sobecki pointed out) it was included in BNF exhibit on La Mer that is still accessible via the library website. In the course of my various ecocriticial projects I've been thinking about what it means to live intercatastrophe -- not just to dwell in between cataclysms (for medieval people, between the water of the Flood and an apocalypse of flame to come; for us, between a vanished age of ice and the fire of a global warming), but also to dwell within unfolding disaster. What does it mean to inhabit ceaseless calamity, a world without stability? 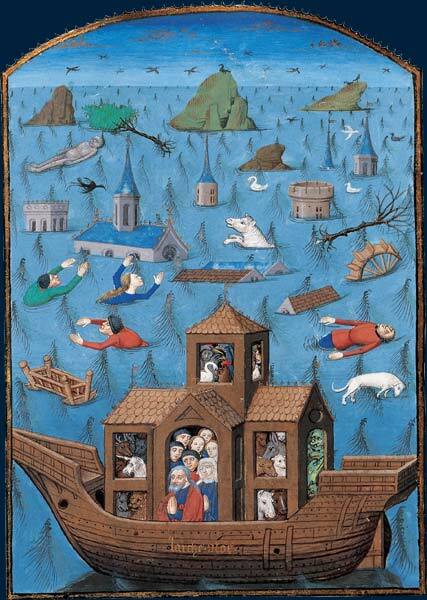 This late medieval image of the aftermath of the Deluge ruminates, I think, over a similar question. 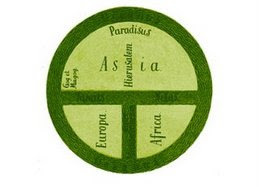 Its illustrator no doubt possessed more faith than I have in providence, teleology, and justice to come, but there are details that make me hesitate before that statement as well. Noah, his family, and the animals they have chosen as intimate companions float serenely in their house, the ark ("box" in Hebrew, but usually depicted as a ship). Outside are those for whom there was no room in the floating home: humans desperate for the safety vanishing churches and cathedrals cannot offer; a cow and dog wondering why they were not partnered into inclusion; the flooded detritus of a once vibrant town. A waterwheel spins in useless motion, overwhelmed by the element it once craved. Oh yes, the dead and drowning were sinners and they deserved their watery suffocation. Genesis is clear. But why is that cradle floating so close to the ark, so like the wooden boat in material and shape, yet empty of its tiny occupant? Some birds in the picture swim indifferently, but others glide in the background, nervous perhaps at their vanishing places of rest. A grey corpse, a tree arrayed like a cadaver, and a nearly submerged rock float in the watery left corner -- devoid of life, maybe, yet somehow rather vital at the edge of their obliteration, vital in the midst of what is also perhaps their mineral, arboreal, and all too human intimation that the ark was built against what could have been a more livable, more collective, more complicated world. Official info on the image: Bibliothèque nationale de France, Français 28. f. 66v (Noah’s ark). St Augustine, De civitate dei. Rouen, 3rd quarter of the 15th century. James Smith linked me to the Holkham Bible version, with Noah floating above a sea of the dead, while Tina Fitzgerald pointed me towards a depiction of the ark as box in the Bedford Hours (and in this image the drowned world is being repopulated). And one more from Sarah, this time with a crowded boat and an opaque green sea. Will you please stop taking words out of my mouth, or at least wait until my paper is done?! Sheesh. Which is really just to say, this is lovely. I especially like thinking about ecological calamity as something that occurs ceaselessly. It seems to me that sometimes we give ourselves too much credit/blame for living in a (self-created) moment of unique vulnerability, forgetting that we have always been subject to catastrophe. Which is what my paper is (was? is) about. Is! Don't give up on the topic, Haylie ... so much to say on this one. And I know you will say it well. Such a great posting, Jeffrey! I'm so very intrigued by your little "note" actually -- all the shapeshifting visual idioms that medieval illuminators used in order to portray Noah's Ark upon the sea (dwelling, box, reliquary) ... invites the question of what containment really means. Wait, is there a UNICORN in that ark?? Thanks for the great post! What struck me about the picture is its questioning of boundaries: the apparent arbitrariness of who is saved and who isn't, and the fact that everything in the water could be used to build/create another ark, like a construction kit. The swan, the ox, and the dog can be found both within the ark and outside of it, and the people too are ver similar within and outside of the ark (red shirts/coats, a black hat). The crammed building on the ship is like one of the churches drowned in the water, complete with a weathervane... 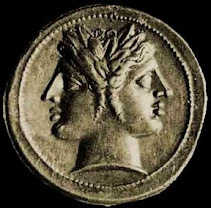 Chaos and order are really two sides of the same coin, highlighting the precarity of life. Is there a unicorn in the ark? The resolution of the picture is not the best so I have not been able to tell for sure if it is one or a trick of the eye. Eva, beautiful close looking at the picture. I love the connections you have made! Do you mean intracatastrophe? 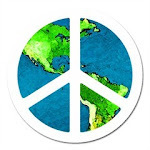 Inter- would mean between catastrophes; Intra- would mean inside or within. I mean both at once. We always imagine we are inter-, but I am arguing that we are in fact intra-. I hope that makes sense. With the spires and such giving the feeling of a pull toward the heavens, I get an Axis Mundi vibe from this image. Much verticality that is somewhat balanced by the tree and the drowned man on their sides horizontally. Nice post and comments.